For the finnisage of the exhibition Paragoge at Skånes Konstförening I will read the text Dear General John J. Pershing. The text was originally written for the event Becoming at the Exploring the Animal Turn conference in Lund, held at the Pufendorf Institute in 2014. The text can be found in the anthology Exploring the Animal Turn: Human-Animal relations in Science, Society and Culture and can be downloaded here –>. Carrier pigeons released in an unknown location always try to navigate home. There are a number of different theories about how the pigeons find their way home. Some think they use their eyesight to follow landmarks, but perhaps the most common perception is that they use the Earth’s magnetic field to navigate their inner compass. 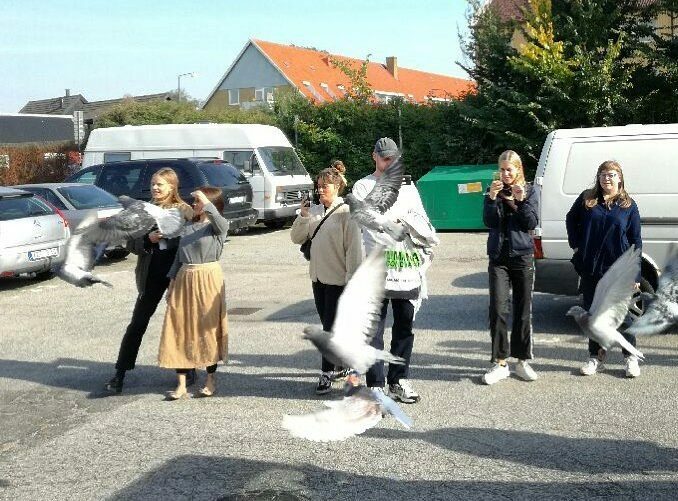 On September 30th, a number of carrier pigeons from one of the Valdemarsro clubs will be released from the parking lot at Skåne konstförening to fly home. The text Dear General John J. Pershing is a letter from the war pigeon Cher Ami to the general who gave her the Croix de Guerre medal for her desperate flight during the Battle of the Argonne in October 1918. The letter will be read out by the Malmö based artist EvaMarie Lindahl who works with extensive drawing projects as well as text. Lindahl is also a PhD student within the field of critical animal studies at the Center for Human Animal Studies at Edge Hill University, UK. Her artistic research and work focuses on the animal’s subordinate position in society and within the arts’ production system.